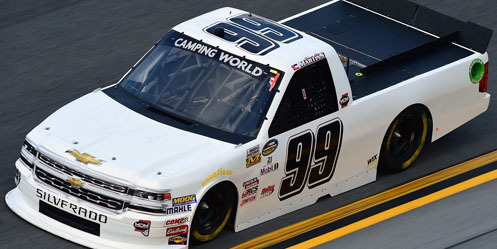 Tommy Joe Martins picked up the 3rd last-place finish of his NASCAR Camping World Truck Series career in Friday’s NextEra Energy Resources 250 at the Daytona International Speedway when his unsponsored #99 MDM Motorsports Chevrolet was involved in a multi-truck accident after 1 of 100 laps. The finish, which came in Martins' 26th series start, was his first in a Truck Series race since last year at Kansas, 19 races ago. The scrappy owner-driver from Mississippi enters his fourth Truck Series season looking to build his program, Martins Motorsports. Last year, Martins’ silver #44 made 20 of the season’s 23 races, leading seven laps and coming home 23rd in points, but a season-best 18th at Gateway was saddled with eight DNFs. In between, Martins has offered an intimate look at the life of an owner-driver through his blog. On February 9, following the departure of sponsor Diamond Gusset Jeans, Martins Motorsports announced a partnership with Brandonbilt Motorsports, the family-backed effort that fielded Brandon Brown’s #86 last year. As part of the arrangement, Brown would drive Martins’ #44 at Daytona with sponsorship from SunFrog Shirts. Martins, meanwhile, picked up a ride with MDM Motorsports. The all-white #99 Chevrolet was fielded by Ranier Racing with MDM, which in 2016 entered rides for Austin Dillon and Brandon Jones, was arranged by Shane Huffman, and Matthew Miller was the listed owner. Martins ran 30th in opening practice and remained 30th in qualifying with a lap of 173.832mph. 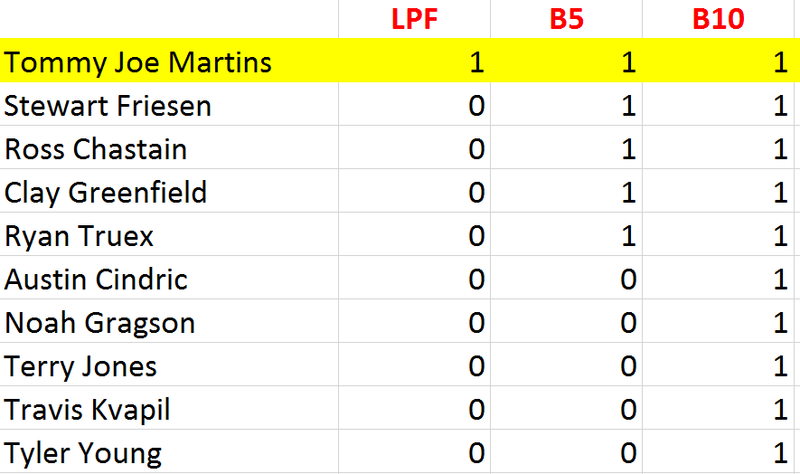 Thanks to MDM’s guaranteed starting spot, Martins secured the third of four provisionals based on Owner Points, placing him 30th on the grid for Friday night. Unfortunately, Martins’ own #44 Brandon Brown turned out to be one of ten drivers who failed to qualify. Those who joined Brown on the early ride home were Chris Fontaine, T.J. Bell, Bryan Dauzat, Tim Viens, Spencer Boyd, Jennifer Jo Cobb, Parker Kligerman, and fan favorites Norm Benning and Jordan Anderson. Starting 32nd on Friday was Travis Kvapil, locked-into the field based on the Past Champion’s Provisional in Beaver Motorsports (former MAKE Motorsports) #50 Florida Lottery Chevrolet. He lost the spot during the pace laps to Wendell Chavous, who pitted Premium Motorsports’ #49 Peak Nutritional Products Chevrolet and surrendered the 28th position. When the green flag flew, Chavous trailed a single-file pack that began to lose touch with the leaders. Fortunately, this kept all of them clear of trouble that broke out on Lap 2. Heading into Turn 1, the #29 Cooper Standard Ford of16th-place starter Chase Briscoe bumped Noah Gragson’s #18 Switch Toyota, triggering a fourteen-truck wreck that completely clogged the track. Picking his way through from the back, Martins nearly had the wreck cleared when Tyler Young’s #02 Randco Chevrolet slid in front, collecting both trucks. The damage proved too severe to attempt a five-minute repair, handing Martins with his second-consecutive last-place finish in the Truck Series opener. Next week at Atlanta, Martins will return to his #44, looking for a much-needed turnaround. The rest of the Bottom Five was filled by the Lap 2 accident. 31st went to Canadian dirt tracker Stewart Friesen, whose #52 Halmar International Chevrolet was prepared in cooperation with Tommy Baldwin Racing. 30th went to Ross Chastain, who raced Bolen Motorsports’ #66 Rugged Cross Blinds / Waterfront Services Chevrolet. 29th belonged to owner-driver Clay Greenfield in his #68 1-800-PAVEMENT / BH Holmes Construction Chevrolet. Rounding out the group was Ryan Truex in the #16 SeaWatch International Toyota. *This marked just the third last-place finish for the #99 in Truck Series history, and the first since May 30, 2003, when Carl Edwards’ unsponsored #99 Roush Racing Ford crashed with Rich Bickle after 5 laps of the MBNA Armed Forces Family 200 at Dover. The number had never before finished last in a Truck Series race at Daytona. 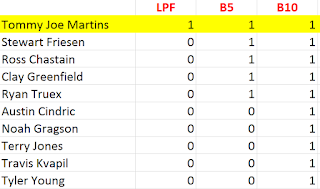 UPDATE: Added details of Martins' most recent last-place finish; correction on MDM team owner.